Ever-more popular in an era in which families are looking for interesting ways to 'staycation' as well as to get the kids away from their gadgets and out into the open air, glamping combines, as the name suggests, a back-to-basics outlook with touches of luxury and even glamour. Most of the following sites don't have electricity, so pack glowsticks and, as the campfire crackles and tealights twinkle, lie on your backs and spot the shooting stars. Stay at this unique site with its dozen canvas tent pods and you'll get VIP access to Gerald Durrell’s famous animal park, of which it is a part, plus the option of special wildlife experiences. Comprised of three Mongolian yurts and two safari tents, all sleeping six, in a farm meadow, this place will have you feeling like an extra in BBC’s Springwatch: foxes, rabbits, deer, badgers and owls call it home. Add a stream to dam, Ebony the Dartmoor pony to pat, campfires to build and dens to build in the woods, and you’ve got a brilliant back-to-basics break - although free toyboxes, Yogini sessions for kids, and reflexology, yoga and massage for parents all bring a touch of civilisation for those who need it. One for the less sociable, this safari-style tent sleeping six is set in eight acres of woodland that you get all to yourself, although there's also a new 'orchard wagon' (old shepherd's hut) sleeping two on the site - parents of teens might want to leave the kids to the tent and slope off there for a romantic retreat. There’s no road access, so kids can run wild safely; there’s a small treehouse and giant tree-swing. You're also within easy reach of mountain-biking opportunities, a Go Ape treetop course, Paignton Zoo and the sweeping beach at Dawlish Warren. On this family farm in the heart of the South Hams you'll find just three safari tents for six and a Cornish tabernacle based on the tin shacks used by Methodist preachers in the southwest, sleeping two and with its own hot tub and mini bell-tower (making it the perfect parental retreat). The onsite honesty larder stocks ice cream and other local produce, and there’s a games room, a natural play area including a wicker wendy house, and the chance to help out with farm tasks. It may lack the chic of some of the other glamping sites, but this busy holiday park offering safari, yurts, supertents and geo-domes in addition to its mobile homes and chalets is well worth considering for its direct access to a fabulous three-kilometre Atlantic beach. It also has its own surf school. In an Area of Outstanding Natural Beauty just minutes’ drive from a beach on the Lizard Peninsula, this spot offers two safari tents plus a ‘tin tent’ (industrial-chic former shipping container) in 12 acres of wildflower meadows with sea views. There’s blissfully little to do but swing in the hammock, chill out around the firepit and stargaze, although surf lessons are available locally if you feel energetic. On the edge of Bodmin Moor, one of the UK’s original yurt camps has sumptuously furnished yurts for three, four and six. Kids can get down and dirty with nature: there are trees to climb and a river to swim in, plus, during the summer hols, bushcraft classes for ages eight and up. Owner Tim makes yurts on site, and guests are welcome to visit his workshop to see how. When the kids get grubby, the bathroom yurt with its wood-burner fuelled rolltop bath and skylight to the stars will have them queuing to be dunked. This loch-side site with gorgeous mountain views and watersports marina, offering everything from Canadian canoe hire to zippy RIB trips, includes ‘wigwams’ (camping pods) and geodesic domes, the first with BBQ areas, the second with firepits. On an arable farm 40 minutes from Edinburgh, in East Lothian, this charming site offers seven treehouses and seven safari tents beside a magnificent beach, plus a farm shop, BBQ, campfire facilities and a kids' corner with chickens, ducks, rabbits, ponies and lambs (which you can bottle-feed in spring). These safari tents on a working goat farm on the edge of the gorgeous Forest of Bowland are especially brilliant with younger kids, who relish the opportunity to engage with farm life. See our feature on a family break at Dolphinholme House Farm or check out our Feather Down Farm page for properties around the UK plus current special offers. A fabulous place to get away from it all, this cluster of safari-style tent sits beside a lake where you can go boating and swimming Swallows and Amazons style. Read our feature on a family break at Wyresdale Park. This sustainable collection of woodland shacks, yurts and a camping barn is part of the 20,000-acre Swinton Estate in the Yorkshire Dales and includes a cafe/bistro that functions as a community hub. Read our feature on a family break at The Bivouac. This sociable camp about 15km north-east of York has a huge campfire and a communal tent where you can help yourself to tea and cake. Accommodation ranges from lodges and woodland tents sleeping six and bell tents for four to woodcutters' huts, also sleeping four. There's some natural play equipment, but kids are encouraged to play wild. The latest addition to the Alton Towers Resort brings luxury treehouses with hot tubs and cute woodland lodges to a woodland setting; packages can include theme-park tickets, and there are also high- and low-ropes courses. These six vintage-chic ‘canvas cottages’ with Aga-style ranges and luxury bathrooms are handy for family attractions in Leicestershire, Derbyshire and Warwickshire, including Bosworth Battlefield, Conkers in the National Forest, and the National Space Centre. But kids won’t want to stray once they’ve clocked on they can help collect eggs, milk cows and groom Shetland ponies. There’s also a pizza oven and BBQ. You can stay in the house or lodge barn on this working smallholding, but the most fun is the kitchen garden with its treeboat, wagons, yurts, tipi and VW campervan; exclusive use is available if you want to create your own mini festival. There's plenty to do, including cookery classes, swimming, fishing or canoeing in the river, apple-scrumping or helping feed the poultry and rare-breed pigs. With advance notice, owner Olivia, who in a previous life worked under Gary Rhodes and Fergus Henderson, will prepare meals from home-grown/local produce. A world away from the rustic sites but lots of fun, this medieval-themed camp in the Knight's Village on the historic castle estate sleeps five or six in standard tents or luxurious Kings tents including a four-poster bed, two thrones and a chessboard. Packages include evening entertainment, breakfast and a second day at the castle free. There are also wooden lodges. 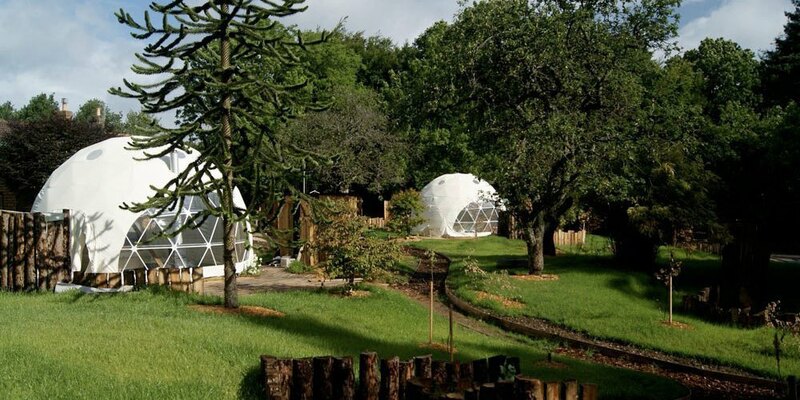 At night, these 11 eco-friendly geodesic domes glow like Space Age beacons in the depths of the ancient Forest of Deans. Sleeping five, seven or eight, all have ensuite washing facilities, while cooking is done on stoves and real fires. For the ultimate in parental kudos, book one of the mud-and-clay-covered Hobbity Domes, sunk into the ground - cosy for four and a squeeze but possible for five. On the doorstep are bike trails, canoeing and llamas to go walking with, while Offas Dyke, Tintern Abbey and the Puzzlewood woodland are nearby. Ducks, hens, cows, sheep and pig inhabit this working organic farm between the Cambrian Mountains and Cardigan Bay, where you'll find four yurts sleeping five or six plus an old wooden railway carriage for four. There are a play area, a pizza oven and a communal cooking/dining cabin. Firewood, board games and welcome baskets of organic farm goodies are provided, and there’s a handy farm shop. Beside the River Teifi gorge and Teifi Marshes nature reserve, this lively Pembrokeshire site includes accommodation in geodesic domes, kata cabins, bell tents and camp shacks. It also has its own little pub, a pizza tipi and a woodland cedar barrel sauna, and activities including coasteering and whitewater rafting are available nearby. Another forest site, the ‘sea camp’ at Manorfan in Ceredigion, also includes log cabins and geodesic domes. Bell tents for five and shepherd’s huts for two provide simple but comfortable lodgings on this working farm where fabulous organised activities including Viking field games (archery spear throwing, axe throwing, sword fighting and sling shots). There’s also a straw-bale movie house and massages – which you can take on a blanket in the long grass for a real back-to-nature feel. Among a wide choice of accommodation possibilities at this New Forest holiday village are camping pods and safari tents. What the site lacks in intimacy it makes up for in facilities, including indoor and outdoor pools and activities including archery, falconry and a soccer school. This luxury campsite lets you spend the night in a safari tent before and after enjoying the themepark rides. Dinner is served in a safari-themed restaurant exclusively for glamping guests, and there’s access to a swimming pool and evening entertainment in the on-site hotels. This sustainable seven-acre site on 650 acres of farmland just outside Arundel comprises scout tents for four, bell tents for five and yurts for four or five; exclusive hire is available if you want to make a party of it with other families. Friday nights see giant camp stews, followed by hot chocolate and toasted marshmallows. From then on, the cooking’s up to you (each tent has a BBQ), though you can order a Saturday-morning breakfast hamper to ease you in. Forest schools take place in summer. For a safari park experience without leaving the UK, this 600-acre wildlife reserve includes wooden lodges, camping pods and treehouse suites among its overnighting options, as well as a cottage and hotel. Optional extras include behind-the-scenes tours. 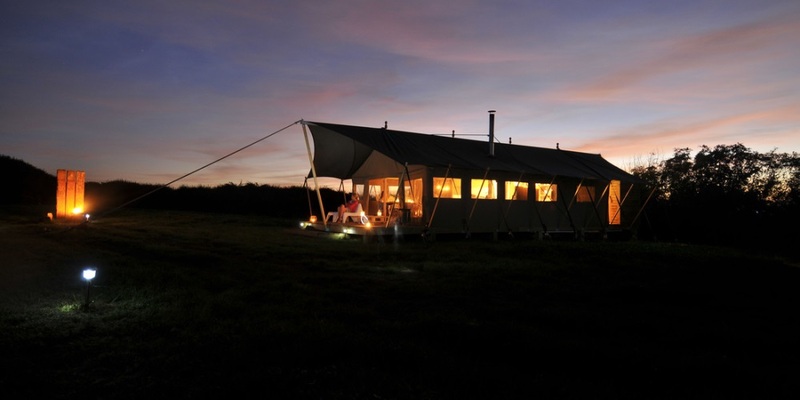 These cosy, electricity-free safari-style tents sleeping six or 10 occupy two sites about 5km apart, both handy for the north Norfolk beaches. There are private campfire areas, countryside to roam, a chicken coop to raid and other rural delights. In summer, band together in a group of up to 12 people and you can book an exclusive-use Wild Camp. This intimate family campsite in the grounds of Mannington Hall in northern Norfolk has tents with space for up to six, cooking facilities, lanterns and a firepit, plus a shepherd's hut sleeping three at a squeeze. There are also woods and wetlands to explore, access to around 30km of waymarked footpaths and the chance to spot kingfishers, herons and otters. There's a second site, Wiveton Hall. See also our features on Best Treehouses, Glamping and Unusual Camping Sites in Northern France for options a short hop across the Channel.